Maintain operational hygiene and system baselines. Manage systems which may be online for short periods. Rerun packages which become applicable as system states change. Deployments do not run outside of a maintenance window unless the Override maintenance window option is selected in the deployment options. You must create at least one maintenance window for other deployments to run. For more information about creating a maintenance window, see Managing maintenance windows. Create a software package or bundle. See Managing packages and bundles. If you want to notify the end users of your endpoints about the start of deployments or restarts that occur after deployments, install the Tanium End-User Notification solution. See Tanium End-User Notifications User Guide: Installing End-User Notifications and Endpoint restarts. To deploy a software package, click the name of your package and then click Deploy. Select the software package operation. Choose at least one target for the deployment. Choose whether you want to base this deployment on a deployment template. To create a new deployment template based on this template, select Create Deployment Template. For more information, see Create a deployment template. You can choose from your browser time or local time on the endpoint. Specify a deployment type. You can either do a single deployment with a specific start and end time, or an ongoing deployment that does not have an end time. If you want the endpoints to download the deployment content before the installation time, select Download immediately. You can enable end user notifications about the deployments. Select Notify User in the Pre-Notify User section. You can then configure settings that allow the user to postpone the start of the deployment. You also must configure the Message Content that informs the user about the deployment. To preview the window that displays the message and postponement options, click Show Preview. To minimize concurrent CPU utilization and disk input/output, select Distribute over time and indicate the time. If you want to ignore deployment restrictions, select Override maintenance windows. Select whether to restart the endpoint. For more information, see Endpoint restarts. You can enable end user notifications about the completion of a deployment with or without a restart. Select Notify User in the Post-Notify User section. If you enabled endpoint restarts, you can then configure settings that allow the user to postpone the restart. You also must configure the Message Content that informs the user about the restart. To preview the window that displays the message and postponement options, click Show Preview. Restart silently and immediately after deployment. This option is typically used for servers and production machines in conjunction with maintenance windows and change control processes. Specify the amount of time in minutes, hours, or days before the endpoint must be restarted. The deadline is calculated by adding this value to the time the deployment completed for each endpoint. Specify the amount of time in minutes to show the final notification before restarting the endpoint. This notification also shows a countdown until restart. If this notification is dismissed, it will reappear after one minute. Set a low value because this option is meant to signal a forced restart that cannot be postponed. If you want to give the user an option to defer the restart for a specified amount of time, select this option. A user cannot postpone beyond the deadline. Specify the amount of time in minutes, hours, or days that a user can postpone the restart. Specify the title and body of the notification message. You can use ||OPERATION||, ||PACKAGENAME||, or ||DEPLOYMENTNAME|| as variables in the title or body. If you are deploying a software bundle, the bundle name is used for the ||PACKAGENAME|| variable. Upload optional icon and body images for branding to avoid confusing users and to limit support calls. Click Show Preview to preview the notifications. End user notifications can be added to existing deployments by stopping, reconfiguring, and reissuing the deployment. If no user is logged into an endpoint, the endpoint will restart immediately after a deployment completion even if the deployment is configured for a notification. A software bundle is platform-specific and each software package evaluates and installs independently, but is available only for the specified OS platform. If an individual package fails to install during a bundle deployment, you can decide if the bundle should continue and install the remaining packages, or you can choose to stop on failure and report the failure. To deploy a software bundle, click the name of your bundle and then click Deploy. Verify the software bundle details. You can get the deployment results by status, any error messages, and the deployment configuration details. In the Deploy menu, click Deployments. Select either the Active or Inactive tab. Install/Install or Update/Update/Remove Summary shows the package name, package size, and operations. Install/Install or Update/Update/Remove Status has the install status, number of online endpoints, and the date and time of the last status update. The results are split out by status with the Interact icon to see the results by endpoint. Error Messages include a brief description, the count of affected machines, and the Interact icon to drill down. Deployment Details provides all the configuration information. Targeted Computers lists the targeted computer groups for the deployment. You can restart a stopped deployment or reissue a one-time deployment. Reissuing a deployment creates a new deployment with the same configuration and targets. From the Deploy menu, click Deployments. On the Inactive tab, click the deployment name. You can stop a package or bundle deployment, but it does not remove packages that have already completed installation. On the Active tab, click the deployment name. Go to the Inactive tab and click the deployment name to verify the status. 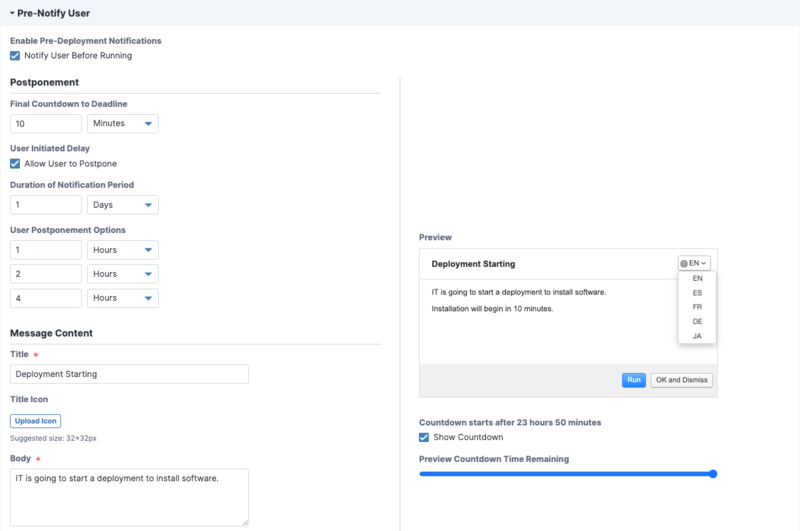 You can create a deployment template to save settings for a deployment that you can issue repeatedly. You can either create a deployment template from the Deployment Templates menu item, or you can select an option when you create a deployment to save the options as a template. From the Deploy menu, click Deployment Templates. Specify a name for your deployment template. Select deployment options. These options are the same as the options you can configure in an individual deployment. You can use this template when you create a deployment.